~ Quinton Carlin ~ Coaching&Consulting: Forget Materialism....Try Minamilism. However, now he has sold or gave everything he owns away over 1 years ago, this is the first email he sent letting his client list know about this experiment. I decided to go every other night without sleep. So I would stay awake for stretches of 30-35 hours straight and then crash for 9-12 hours. I got a lot of work done by doing this. And I was able to do this for about 3 months straight – sleeping only every other night. There was only one problem… it put me in the hospital. It had weakened my immune system and I ended up with a bad case of vertigo. Horrible, horrible stuff. I was basically DIZZY all day, everyday, for about 2 weeks until it finally went away. So I, obviously, went back to a normal sleep schedule and refused to pull “all nighters” anymore. I had bad insomnia for a long time but eventually got over it. If you’re pulling all nighters and going without sleep, I recommend you don’t. It’s just not worth the damage it can do to your health. But I’ve done many other “full immersion” types of experiments on myself over the years, and most of them didn’t have bad health results – thankfully. My point is… you can learn a lot about yourself if you take yourself out of your normal comfort zone and really ‘challenge’ yourself by trying little experiments and personal challenges. AND I’M DOING IT AGAIN. Check this out. I just finished selling (or giving away) all of my personal possessions. Not too long ago my life consisted of a massive 6-bedroom house (with many rooms I never even went into!) and 5 cars. Yes, FIVE cars. I’m a car guy, what can I say. I had accomplished what many consider to be the “American Dream.” I had the huge house and all the toys. The Lamborghini, Ferrari, BMWs, a Rolex collection, an expensive wardrobe, amazing furniture, a massive home theater, a 1,000 gallon saltwater aquarium, the works. I don’t own any furniture. I don’t own a TV. I don’t own any books. I don’t own a huge closet full of clothes. I don’t have a HOME. Not a house, or apartment, or anything. By now you’re probably thinking, “John, what the hell are you doing! ?” I decided to do all of this because I wanted to do a new experiment on myself. It’s a challenge of MINIMALISM. If you haven’t yet heard about minimalism, or read anything about it, you should. Not only can it (I believe) improve the quality of your life but it can also make your business a lot more profitable. Minimalism is essentially focusing only on the 3-4 most important things in your life (or business) and ELIMINATING THE REST. There many opinions on minimalism and how to apply it, and some approach it differently. Do some Google searches for “minimalism” and you’ll find lots of great blogs about it. It’s really a growing ‘revolution’ of sorts. I don’t agree with everything he teaches, but a decent book you can read is The Power Of Less by Leo Babauta; and he’s someone with 6 kids. That will get you started. Everyone will have their own take on minimalism. But I’m willing to bet you can benefit from it. THAT’S IT. That’s all the ‘stuff’ I own. ALL OF IT. 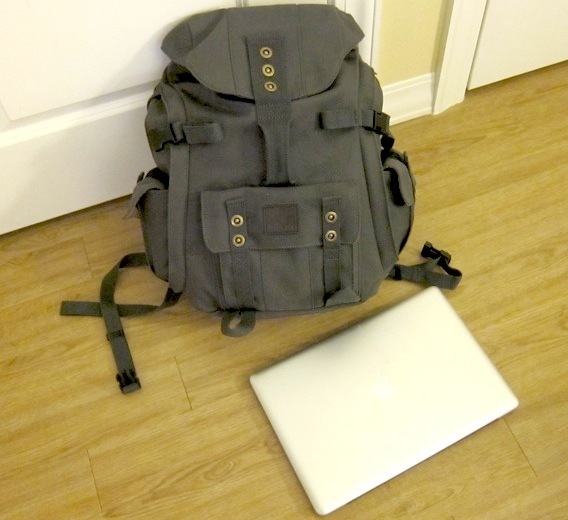 Here’s a photo of my backpack (with everything in it) except for my 15″ MacBook Pro which is in the photo next to it. WHERE ON EARTH WILL I LIVE? The answer is… Everywhere. I am just going to travel the world non-stop for awhile. It may be for a year or for 10+ years. I don’t know yet and that’s part of the adventure. I have structured things so I can travel the world INDEFINITELY and plan to do so for a very long time. As many of my long-time subscribers know, I love to travel. I’ve been to every continent in the world except for Antarctica. (And hope to visit their soon.) But even as much as I love to travel, I was only taking a few trips a year. So now that’s all going to change. I found that my CREATIVITY has really suffered because of this. It’s like the brain only has so much available RAM like a computer, and everything we own and do and manage takes up that space. It doesn’t leave a lot of room left for creativity. So essentially, I wanted my brain back. I wanted to have what I call “Freedom Of Thought.” I want to have so few distractions and things taking up space in my brain that I’m free to use as much of my brain as possible to think of exciting new ideas and fully appreciate new experiences. I did also realize that all of that “stuff” that I thought was the “American Dream” was mostly based on EGO. But that’s a discussion for another day. As many of my customers already know, late last year I started a new company to develop Video Games. It’s been a dream of mine for many years and I finally decided to pursue it. Well, this new business (along with other projects) really demands maximum creativity from me. So I wanted to try this new ‘experiment’ to give myself the best chance at being able to come up with amazing new ideas. I’m currently on Day 3 of my journey. I moved out of California about a week ago, then spent a few days visiting my family in Florida, and then 3 days ago I ‘officially’ set out on this “Minimalism Adventure” and flew up to Toronto, Canada (where I am now) to visit my good friend, Dean Jackson. In the first 3 days, I’ve already come up with some unbelievable new ideas for my businesses. And this is only just the beginning. I would like to challenge you to look at your business (and life) and see how you can apply the Pareto Principle (80/20 Rule) and eliminate the things that aren’t essential to your goals — or things that take away from the more important parts of reaching your goals. I recently deleted my personal Facebook account (that had 5,000 ‘friends’) and it was one of the best things I ever did. I was finding that Facebook was one big waste of my time. I was logging in multiple times a day and it was robbing me of time I should have been spending on more important things. Don’t get me wrong, I think Facebook has decent marketing uses, but I think for most entrepreneurs it’s better used for brands (with Business Page accounts) than as a personal account. For me and all of the businesses I am involved with, Facebook does not fall into the “20″ part of the 80/20 rule. PPC, SEO, buying media (which includes Facebook Ads), and other strategies out-produce it by a massive amount. But that’s a rant for another day. Okay it’s time for me to go and pack up my stuff — even, though, it only takes me about 5 minutes. I’m heading to Europe for a few months tomorrow as I continue on my journey. I’ll be in touch soon. So that was his PRE TRIP message, here is his POST TRIP Message upon returning after a year of "walking the earth"
"In early 2010, I decided to get rid of all my possessions and literally set out to just walk the earth for awhile. I still had my money in bank accounts, but I got rid of everything else except for a small backpack that carried a few days worth of clothes, a MacBook, and an iPhone. That’s a photo of it above, taken right before I left on my journey. I even shutdown or got rid of many Web sites and business projects I had at the time. It was literally like wiping the slate clean and starting from scratch. I sold my house and the multiple cars that I owned at the time. So I literally went from a massive house, multiple exotic cars, a huge collection of clothes & watches, every toy & gadget anyone could ever want, and tons of other STUFF down to just a small backpack that contained a few essential things — all told I was down to like 19 total items. This included a few days worth of clothes, a pen, a toothbrush, razor, etc. etc. Why Did I Decide To Get Rid Of Everything? I was unable to think to the best of my ability due to all the chaos around me. That’s the easiest way to put it. I had so much stuff in my life that my brain was busy managing it all. I had very little thinking power left to use for creativity. The core concept behind Minimalism is to get down to only the things that are most important to you so all of your focus will be on just those things. This is so true and most people don’t realize it. Those boxes in your attic. That extra stuff shoved into the bottom of your bedroom closet. All that ‘crap’ you have in your garage. The gazillion things stuffed into that one drawer in your kitchen. Everything that you have in your life your brain knows about it. You may not always think about it, but a part of your brain is being used to manage having all of that stuff — even if you aren’t actively using those items. Think of your brain like RAM in a computer. Your brain can only store so many thoughts, memories, and tasks. The less “free RAM” we have available I believe the more overwhelmed we begin to feel and the less brain power we have available to be creative. Even if you put things away in storage, somewhere in your brain it still knows that you have those things and it uses some of your mental RAM to be prepared to remind you of those things should you ever have a need for any of it at some point. The other reason I did this is because I was very UNFULFILLED. I was unhappy, and even a bit depressed. I had everything I had ever dreamed of owning and yet it wasn’t making me happy. The huge house, all the cars, and all the other stuff. I had always worked hard to be able to one day buy that stuff, yet once I had it nothing magical transpired with my happiness level. I wasn’t suddenly brought to this place of amazing happiness like one would be led to believe. Dreams are very powerful. Dreaming about certain things you hope to eventually have in your life, etc. Yet I’m here to tell you, when it comes to material possessions I pretty much had everything I had ever dreamed about since I was about 12 years old — and it didn’t make me happy. I realize now that a lot of that stuff was simply for EGO purposes. For example, I used to drive a black on black Lamborghini Murcielago. It was the ultimate head-turner. Everywhere I went people would take photos of the car and ask me about it. Driving down the road people would point at the car and even go around other cars just to get close enough to check it out. It made me feel good. It made me feel important. At least for a short while. I liked being admired and getting the attention that the car brought. Now I do love sports cars and the performance aspect, but if I am to be completely honest, I had that car because NOT MANY PEOPLE ALSO HAD IT. And that’s the important point. I really enjoyed the fact that I had something that 99.9% of people didn’t have. Unfortunately, this mindset is how our culture trains us to be. Keeping up with the Joneses. Having better stuff than our neighbors so we can in some way feel more important about ourselves. And I got caught up in all of that like most people do. All of that is obviously nonsense. In recognizing this, I wanted to see how I would feel if I simply got rid of not only my fancy cars, but EVERYTHING. How would I feel and think if I just got rid of everything and was only left with MYSELF? So I got rid of all my stuff, packed my little backpack and I set out to travel for many months. I started in Europe and then made my way to Central America. While it was really scary to start that journey, it was also very exciting. The biggest difference was in my MINDSET. I now had all this free brain RAM available to think about anything I wanted. It was an awesome feeling. My creativity, that I felt like I was lacking for many years, came back full force and I started to come up with some of the most powerful ideas I had every thought of. I also got my passion back for my business ventures and some other things I wanted to work on. I was finally able to use my mind to figure out what was most important to me, and to allow me to focus just on those things. The same benefit of doing some house cleaning and getting rid of tons of material items also happens when your brain is emptied out. I also discovered that my core happiness had nothing to do with EGO. The reality is, the world doesn’t really care about me, not in a way that I’m so important that it matters that much. So all that matters is how I feel about myself. What if I lived on an island without any neighbors or anyone else to try and impress. Would I still want some of those fancy show-off things that I had before? No, because there would be no reason for it. Now please don’t get me wrong, I still appreciate nice things. But there’s a difference in having nice things only because you enjoy them or having them because it makes you feel good because others know you have them. A lot more pleasure and happiness comes from much simpler things when you strip away all that other stuff… like how much we value not being stressed-out, being able to relax, not having health problems or body pain, being able to enjoy and appreciate the outdoors and the planet we live on, and to cherish our valued friendships & relationships. Ultimately, the highest valued parts are our experiences. Creating many little happy moments. When it comes time that our life is about to end, those are the things that we will remember and cherish most, not all the other stuff we had going on in our lives. If you took a moment to read My Story then you will have noticed a common theme… spreading myself too thin. Having too many ideas I was working on at one time. You should apply the minimalism concept to your business. Get rid of all the tasks, ideas, and things that aren’t absolutely critical for you to move forward and bring in more money in your business today. Get a notebook and log all of your other ideas. Then put that notebook in a safe place and know that those ideas will still be there when you’re ready to come back to them. Then go and simply focus on your current business projects, at least the one that can bring in the most money the fastest; because that’s what will accelerate all of your business growth. Otherwise, having too much stuff going on is a major distraction and it is costing you money everyday. UPDATE: I am no longer traveling at the moment. I decided to setup a new, simple home base back on the East coast to be closer to my family and to take a break from traveling — being on the road is very tiring. Very cool message from John Reese indeed. As someone who has traveled to over 26 countries, I feel that EXPERIENCE, not material consumption, is the most important virtue someone can accumulate, and until society realizes it is not 'stuff' or money that makes us happy, but merely a intimate & conscious connection with ourselves and others is what really matters, the world will continue to spiral in a uncharted, downward direction of depression, both economically, and emotionally. I highly recommend the documentary called "I AM" produced by a Hollywood Producer who got rid of everything to teach Political Science at Peperdine University asking the question, Whats wrong with the world, and what can we do about it?